Your bookstore or library can order from Ingram. 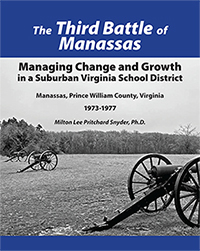 Milton L. Snyder, Ph.D., served Prince William County, Virginia — as Division Superintendent of Schools from 1973 to 1977 — during a period of dynamic population growth and political upheaval which impacted both the governance and management of the school system. Upon arrival in 1973 he stresses to the news media that he is coming to the county with a completely open mind and looking forward to creating conditions in the school system for community involvement. In these essays he shares his recollections of the activities, successes, and sometimes failures of leaders in the county during this formative period, and the impact of their actions on the school system. These are his individual views concerning the various actions of the school board, the county board of supervisors, and others associated with the schools and with the county government during the years he served as superintendent of schools. The accomplishments of teachers, district administrators and school board members during this period prompted the writing of these essays. Included are local newspaper articles and opinion pieces that covered events, along with research letters and other pertinent materials. Out of his cauldron of experience, he learns that it is easy to criticize people in charge. It is much harder to be the person in charge. In 2016 Milton presented "Radiant: The Dolores Jean Gibbons Story." This third book is a tribute to the educational administrative talents of his wife, Dolores Jean Gibbons, M.Ed. Click here.